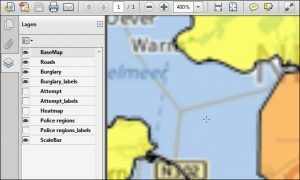 Export | How to export in Excel E-Maps? A map can not only be exported as an image, but also as a PDF file. Use the Save as PDF button. Enter a name and a location and click Save. The map is now saved as a PDF file. 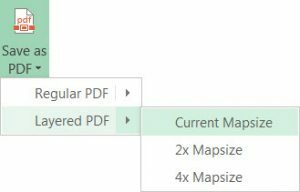 If you have the E-Maps Pro or Advanced version, you will also have the possibility to export tour map to a layered pdf. All your visible layers in the map will be exported as an individual layer in the pdf file. Which allows you to switch layers on and off within Adobe Reader. Ideal for sharing maps with others! Click on the image for an example of a layered PDF. Save the file to view the layers.